The relationship between fish and amphibians is thought to be antagonistic because of the frequent amphibian extirpations after fish introductions, although some field observations show that amphibians and fish often co-occur in rivers. Here, we used surveys in north-eastern Spain (99,700 km2, 15 river catchments, N = 535 sites) to identify the most frequent fish–amphibian associations and the riverine conditions that might concurrently promote the diversity of native fish and of five widely distributed amphibian species. Overall, there was little congruence between native fish and amphibian-diversity measures (species richness and the Shannon, Simpson and Pielou diversity indices). Different riverine conditions appeared to be important for the two vertebrate groups. Alien fish richness, which was highly correlated with alien fish abundance, was negatively associated with amphibian richness and Shannon diversity but was positively associated with native fish richness. River water depth was negatively associated with amphibian occurrence. 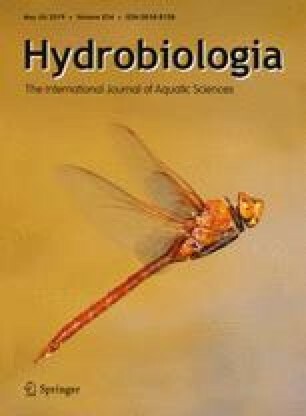 While our snap-shot surveys may be a transitional stage in the fish–amphibian relationships, we found that some widely distributed amphibian species co-occur with fish in rivers in north-eastern Spain. Small rivers, such as tributaries often have the most intact fish assemblages, and probably are the best locations to explore fish–amphibian associations in greater depth. The online version of this article ( https://doi.org/10.1007/s10750-019-3945-4) contains supplementary material, which is available to authorized users. We thank three anonymous reviewers and the associated editor Katya Kovalenko for their helpful suggestions. We are grateful to all people who assisted in the field and Mari Piñero-Rodríguez for acting as catalyst for this manuscript. River surveys were funded by Natural Parks (Collserola and Sant Llorenç del Munt i Serra de l’Obac), the town of Sabadell and the Spanish water authorities ‘Agència Catalana de l’Aigua’ (A.C.A.) and ‘Confederación Hidrográfica del Ebro’ (C.H.E.). R Core Team, 2016. R: a language and environment for statistical computing (https://www.R-project.org/). R Foundation for Statistical Computing, Vienna, Austria.